Jobu reviews a huge win for the Giants in week 2. Despite their Week 1 loss to the hated Dallas Cowboys at home, I felt pretty good going into this game. Sure, there were some questio Despite their Week 1 loss to the hated Dallas Cowboys at home, I felt pretty good going into this game. Sure, there were some questions to be answered–would the offensive line gel together in week 2? Would the secondary cover anyone in the middle of the field?– but every team has question, right? The same questions that plagued the Giants in week one plagued them in week two, but Eli recovered from a disastrous first half to almost break the team record for passing yards in a game, and the Giants won one of the most exciting games we’ve seen in a while, 41-34. Here’s how it went down. I’ll be completely honest with you folks: I didn’t watch most of this game. I was out at a wine tasting for my girlfriend’s father’s birthday (yes, Jobu keeps it classy), so I mostly had to follow the game on my phone. I did make it back to the house for the last six or so minutes of action, so I caught the exciting conclusion, which was basically the meat of this game. This game started out pretty crappy for the Giants. Eli couldn’t get it going, and ended the half with three interceptions, including one that was taken 60 yards back to the house by Eric Wright, who, by my estimation, set the record for most broken terrible tackles on a single play. It was ridiculous and, considering it happened with 0:08 left in the half, it could have been a back breaker. A lot did happen before that play though. The Giants led 6-3 after the first quarter. I’m kind of glad I didn’t see any of it, because it seems like it was absolutely dreadful. The second quarter was better from an action standpoint, but not for the G-Men. Tampa’s Josh Freeman (remember I talked about him last week as a guy the Giants could have trouble with) opened the quarter with a 29 yard TD pass to Vincent Jackson to give the Buccaneers a 10-6 lead. After an Eli interception, they marched back down the field and Doug Martin punched it in from eight yards out to make it 17-6 Tampa. The Giants finally showed some life here, as Eli led a drive that culminated in a 23 yard TD pass to Hakeem Nicks, who had probably the best game of his career in this one (10 catches, 199 ids, TD), to make it a 17-13 game. That’s when the absurdly terrible pick-six happened, and the Buccs took a 24-13 lead to the half. It put an exclamation point on a terrible half for Manning and a lot of Giants fans got that here we go again feeling going into halftime. To add insult to injury… or I guess… injury to insult, the Giants lost one of their O-lineman, David Dhiel, to a knee injury (it is now believed to be an MCL injury) and starting running back Ahmad Bradshaw to some kind of neck injury. Things were not looking good for Big Blue. The third quarter was more of the same from the Giants. Tampa started the scoring with a 52-yard Field Goal by Connor Barth, and the Giants countered with a Field Goal of their own as the quarter wound down, so the Buccs still had an 11 point lead when the fourth quarter started. It wouldn’t be enough. Eli has basically made his name in crunch-time, setting the record for TD passes in the fourth quarter last season and leading a couple of Super Bowl winning drives against the Patriots over the years, so you had to still feel pretty good if you’re a Giants fan heading into the final fifteen minutes. Eli just gives you that comfort late in the game. Still though, the Giants’ first drive of the quarter ended in yet another Field Goal by Lawrence Tynes, to cut the lead to 27-19. That’s when Eli finally took over this game. 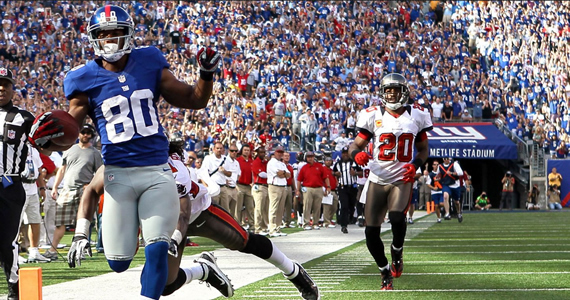 With 6:48 to go in the game, Eli hit Victor Cruz for one of his patented 80-yard TDs. It was nice to see Cruz finally bust out for a big play, but he actually had a great game even without that play (11 catches, 179 yds, 1 TD overall). 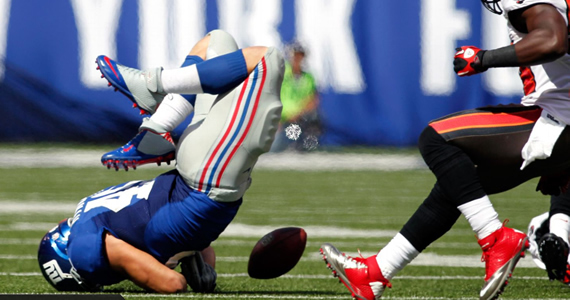 After fill-in Andre Brown ran in the two-point conversion, the Giants had tied the game at 27. They weren’t done. The Giants got the ball back after a quick three-and-out by Tampa, and were in the End Zone just a few plays later, when Eli hit Martellus Bennett for a 33-yard TD. I got home just in time to see this drive, so I can appreciate just how explosive Eli was. He hit a wide open Hakeem Nicks for a long pass right before the TD. It was all very impressive, and the Giants somehow had a 34-27 lead. The defense, which had been playing very well the entire half, finally had their brain fart. Just two minutes after the Giants took the lead, Freeman hit Mike Williams for a 41-yard TD pass (a great catch, but terrible defense by CB Justin Tyron), and the Buccs had somehow tied the game with 1:59 to go! I’ve said it once, and I’ll say it again. 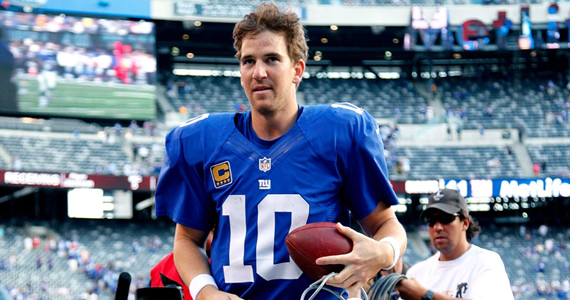 You can’t give Eli the ball in a close game with more than like 30 seconds to go, or you’re going to lose the game. Manning couldn’t have taken less time to retake the lead. He hit Hakeem Nicks for a 50-yard pass to get the Giants into the Red Zone. Andre Brown took over from there, running once for a first down (he smartly stayed out of the End Zone despite the fact that the Buccs were letting him score), and then again for the TD with 0:31 to go in the game. The score sealed the game, but it got pretty interesting towards the end. The defense must have thought the game was over, because they didn’t cover anyone in the last 30 seconds. This led to a couple of completions for Freeman, including what was thought to be a long pass that got the Buccs into the Red Zone with about ten seconds to go, but the play was successfully challenged by the Giants. The receiver never had control of the ball, and the game was over on the next play when Freeman got a little too wild and was picked off by Corey Webster. The Giants had themselves an exciting 41-34 win. Something funny happened on the way to the Giants kneeling the ball to run out the clock. Tampa Bay rushed the O-line and knocked down Manning as he was trying to end the game. 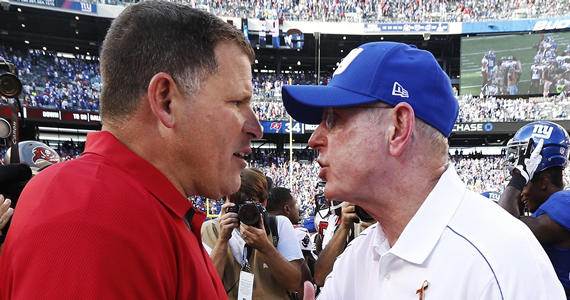 This sent Tom Coughlin into a fit, and he basically scold Tampa coach Greg Schiano at the post-game handshake. Seriously, I think Coughlin grounded him for two weeks. No car, no phone, no TV. After the game, the Giants all expressed their disgust that this “unwritten rule” was violated. Apparently, that isn’t something that is done in the NFL. I happen to think the Giants are wrong on this one. The two teams were involved in a one score game. If that play works, Schiano would have been heralded as one of the smartest coaches in the league. Also, he has a history of doing that, admitting that he tried the play several times during his time coaching at Rutgers. If anything, I think the Giants were unprepared. If a head coach has a history of running a certain play, you should be ready for it. If you’re not, it’s on you. It’s not like the giants were up by two scores and the game was over. A turnover there could have meant a tie game. I can’t fault Schiano and the Buccaneers for running that play, and no one else should.